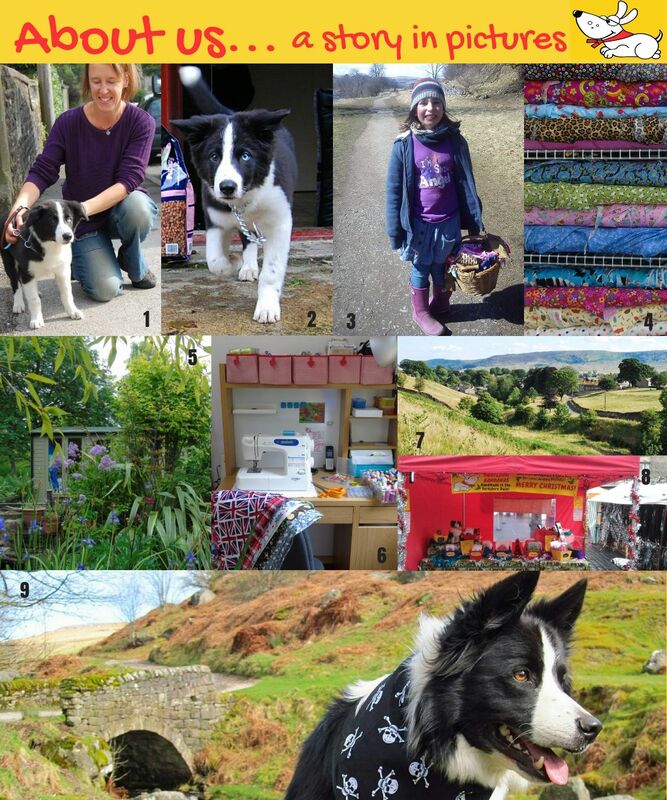 The story of Dudiedog began in 2013 when i made the ‘mistake’ of refusing to buy a poor quality and over-priced dog bandana from a stand at Crufts. I explained to Flo that we could make a better one ourselves for our rescue Border Collie, Skye Blue. Word spread and friends wanted bandanas for their dogs too. Flo was raising money for a Cello, so at weekends she would set off along the riverbank with a little wicker basket, selling bandanas to visitors walking their dogs. After having a little stall at the Grassington Dickensian Christmas Festival, we realised that Dudiedog was becoming a real business. I put away my paints and canvases and bought more fabric! That seems so long ago now - our bandanas sell all over the world! But we’re still the little, friendly cottage industry we started out as. All Dudiedog products are designed and made by me (along with fabric buying, embroidery, communications and social media) - I get REALLY busy sometimes! My aim, as always, is to make the most beautiful, highest quality accessories that are perfect for every dog, whatever his/her size or shape. James and Flo have important roles too - between them they take most of the product and modelling photos. James does some of the administration as well as making lots of cups of tea! Flo, now being a teenager is our harshest critic! Skye Blue has just one purpose in life - to have the most fun possible while being the crazy, adorable supermodel and product tester that we all love so much! Without Skye Blue there would be no Dudiedog Bandanas! Most importantly, I’d like to thank you guys - all of our lovely customers - for being on this exciting journey with us and helping to make the world a happier and more ‘Dudie’ place!